Chef Scott Anderson has created a lot of buzz with the opening of Mistral in King of Prussia, but his original spot, Elements, in Princeton is a true dining destination for fans. Seasonal dishes from locally sourced ingredients are served tableside by the chef who prepared them, and the menu changes consistently, so it’s always a new experience. The dinners do have a tradition: Every meal starts with a signature marinated quail egg. NJ Monthly releases an annual list of the state’s finest dining experiences, chosen by their panel of food critics and reporters, led by deputy editor/dining editor Eric Levin. Congratulations to our talented kitchen team, particularly executive chef Scott Anderson and chef de cuisine Mike Ryan, for putting all their passion on the plate and turning food into art. Located in the heart of Tokyo, L’Effervescence restaurant is famed for its French-Japanese cuisine created by Chef Shinobu Namae. On Saturday, April 23 and Sunday, April 24, you can taste these international flavors without ever stepping onto an airplane. That weekend, the critically acclaimed chef joins Executive Chef Scott Anderson in the elements kitchen to create an innovative menu that combines both locally grown and Japanese spring herbs and spices. Chef Namae has earned worldwide recognition from chefs, restaurateurs, food/restaurant journalists whose accolades include two-Michelin stars in addition to guiding L’Effervescence being ranked in the top-100 restaurants in the world and top-15 in Asia by the The Diners Club Academy. He has worked at Michel Bras’ three-Michelin-star restaurants in Laguiole, France, and Hokkaido, Japan, where he was sous chef. Before opening L’Effervescence, he was the sous chef of Heston Blumenthal’s acclaimed The Fat Duck in Bray, England, and also worked in the restaurant’s pastry department. To get a taste for the world – and some of its finest cuisine, reserve your spot here. Among other restaurants that move is elements, leaving its beautiful stone building on State Road (it always reminded me of the modernist Vandamn house in Hitchcock’s North by Northwest) and arriving on Witherspoon Street, upstairs from Mistral, also owned by Stephen Distler and elements Executive Chef Scott Anderson. Using, of course, locally sourced ingredients, Anderson works to draw out the purest flavors to transform the classics into the new. With just nine tables, the focus is on prix fixe tasting menus. As Distler and Anderson downsized elements, they grew Mistral—named one of the state’s 25 best by NJ Monthly—from 45 seats to 130, and brought along the liquor license with Elements, as well as the North-by-Northwest decor. The menu is divided into “small bites,” “from the fields,” “from the land” and “from the water” (and, of course, desserts). AT THE BAR, the ice for the cocktails is hand-cut into fat cubes for a slow melt and a 20-something mixology nerd sits in the corner, contemplating the careful construction of his drink. Two women discuss isolationism over a plate of Fanny Bay oysters, which, with those gorgeously fluted shells and a spark of spiced kohlrabi, create a regal presentation. A man with bright eyes and a gray ponytail shares a story from PBS. The barfly himself, protective of his favored retreat, offers a pre-dinner briefing: The food upstairs is challenging. Challenging is not the word he wants. Nor is his next description, edgy, the right word. But you can forgive his effort, for Scott Anderson‘s food, complex and grown-up and sexily so, has long been difficult to neatly categorize, and equally difficult to deconstruct and explain to others. 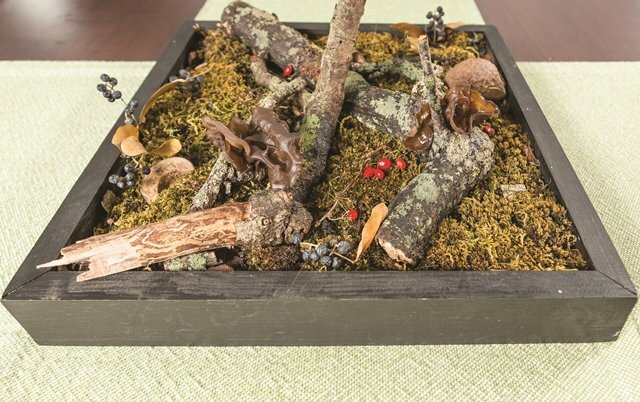 Anderson’s food is also high-end art and precise science, an intellectual construct of ingredients and techniques, layered with, say, juniper or foraged mushrooms for texture and intrigue. Dinner at elements in Princeton is the kind of experience that either leaves people speechless or encourages them to excessively analyze and pontificate. In simple terms, a dinner at elements is this: Mannered. Urbane. Clever. Luxuriant. Restrained. Also, playful. Also, emotional. But the guy at the bar did get one thing right. You don’t have to get it to get it. 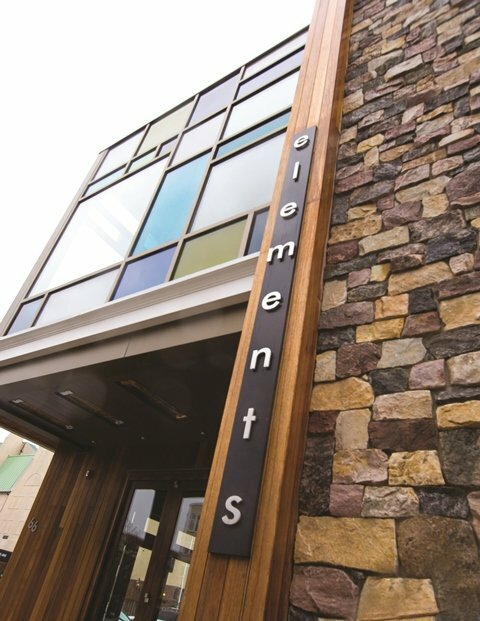 After elements originally opened in 2008 on Bayard Lane, it almost immediately became one of the most important restaurants in the state, a dynamic rebuke of the misfortune of timing it during the recession. 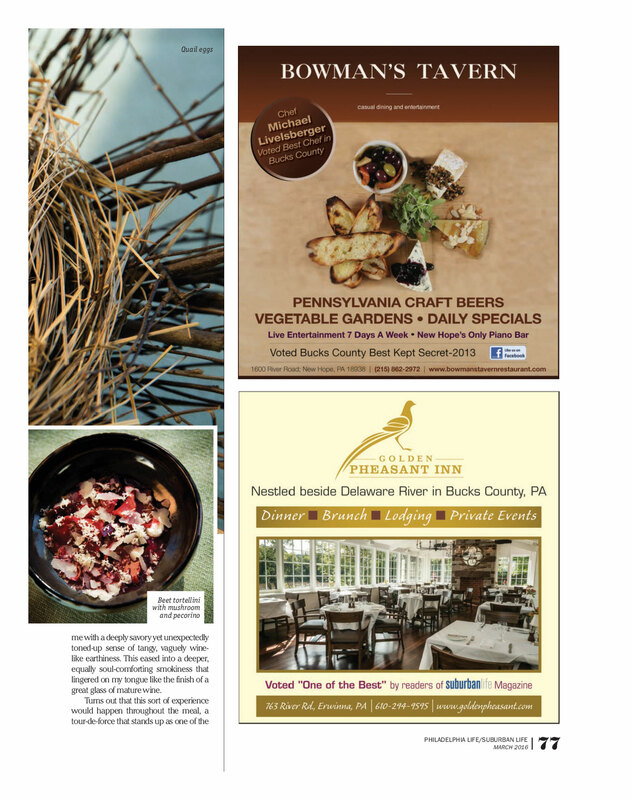 recognized by the James Beard Foundation as a semi-finalist for Best Mid-Atlantic Chef in 2015, 2014 and 2013. Anderson makes presentations to Princeton University doctoral candidates, invites other chef innovators from across the country to share space in his restaurant for collaborative dinners and likes to say that he uses the computer as often as he uses the stove. He fills his social media accounts with photos of cigars he likes and mushrooms he’s foraged, and, every so often, he adds another inspirational tattoo to his collection of body ink. Anderson also opened Mistral, a globally inspired small plates restaurant in downtown Princeton. Now, he’s relocated elements to share the space. The fine dining spot is upstairs, the bar and tapas restaurant downstairs. The new space has just 28 seats and only serves dinner. Anderson calls it his retirement plan, this ability to work fewer than 18 hours a day, seven days a week. In reality? There is focus and there is drive. This is another level entirely. The restaurant serves a weeknight four-course tasting menu for $79, a Saturday five-course tasting menu for $99, a chef’s tasting for $125 and a grand tasting for $185. Each are complemented with the option of beverage pairings. Elements also embraces the entirely unorthodox practice of having the kitchen staff serve the food. The goal is a more intimate experience for both guest and cook. The choreography works, thanks to precise planning, which includes staggered reservations. A 20 percent “guest experience” is added to the bill. World’s Fair of food. 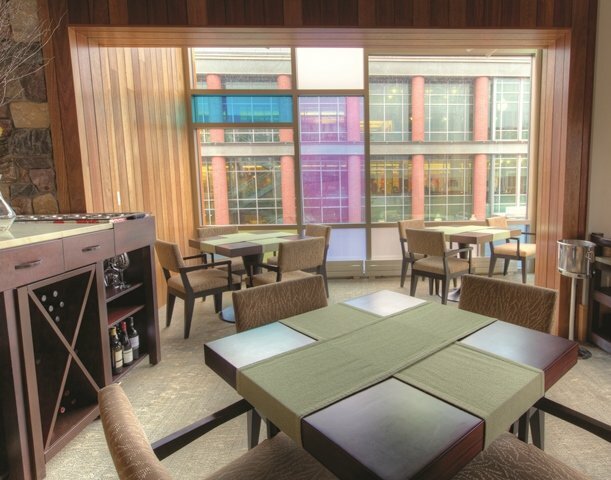 At elements, it’s a celebration, and although Anderson seems intent on opening all the books in the library and sharing every esoteric ingredient on the planet, you’ll have a grand time eating it, too. 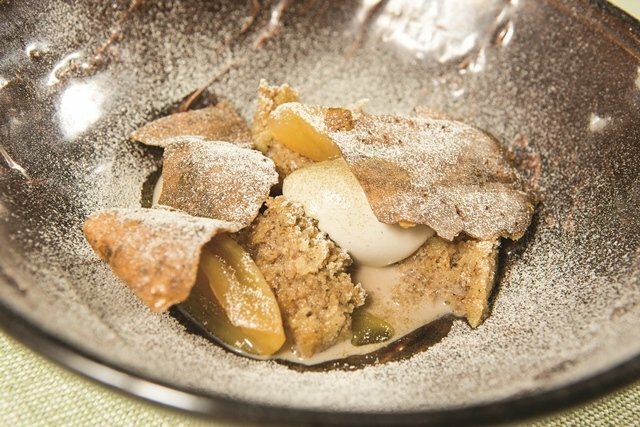 His menu is ever-changing, micro-seasonal and delightfully unpredictable. A delineation of the experience is best scrutinized not by specifics, but by themes. First, Anderson loves eggs and likes to experiment. The quail egg amuse-bouche is a mesmerizing example. Two cooked quail eggs are marinated in wine lees (the residuals after fermentation), then smoked. 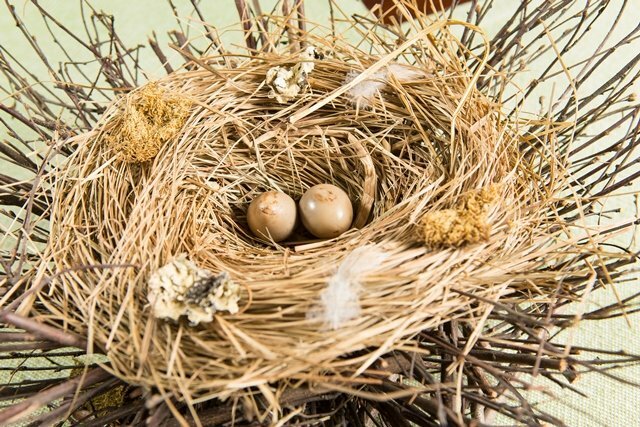 The eggs are brought to the table in a nest, and already you’re thinking it’s too precious, too Etsy hipster. Stop. The egg is a miracle. It’s creamy and sweet, and smoky and warm. The white is cooked and the yolk is nearly syrup, and you’re surprised and delighted, and too quickly it’s gone. “It’s just an egg, when you come down to it.” You end up loving it more. or anise, but not quite, but which Anderson describes as having a numbing effect. Anderson loves seafood and applies a Japanese philosophy: fresh and as simple as possible. For example, the hamachi is not served super cold, as is usual with sushi, but smoked for a few minutes over the grill, for the fat to melt a bit and to better complement the yogurt. Anderson grew up in Japan. Thus, ramen, which must have been good, because it was gone before even one bite was shared. Anderson also loves to celebrate the heritage of the region. Thus, the astonishingly luxuriant venison tartare, with celery, juniper and bergamot, which reads Pilgrim but tastes Paris. And thus, pheasant, which, if your pheasant repertoire is limited, Anderson will help, categorizing the meat as very good “chicken.” “Chickens of the Old World, before they got into the hands of the wrong people.” More dark and mysterious. But this particular interpretation was not as elevated as some other dishes and its hominy “risotto” was soupy and starchy. Desserts have deceptively simple names. “Vermouth.” “Chocolate.” The former features a quenelle of frozen custard, vermouth-flavored, an after-dinner drink as whipped froth, served with buckwheat, hazelnut and fennel. “Chocolate,” with chocolate and almond, is inspired by the Almond Joy, but that’s like saying Sarah Burton’s creations are inspired by street fashion. each), spread some addictive flax crackers with rich, smoked bluefish ($8). Or try the buckwheat short stack with Époisses ($15), a sleeper and a standout, remarkable enough to generate a discussion. You’ll be amused by the remark of the bartender, who will ask, graciously and with no irony, “Are you familiar with Époisses?” As if we all should be aware of a cheese made in a French town, with a population of about 800. Actually, we all should be aware of a cheese made in a French town, with a population of about 800. Thank Anderson for that, too. The guy at the bar is also right, that this is one of the best restaurants in the country. But you knew that already. It is a privilege to dine here. I have a thing for quail eggs, and I mean “thing” in the same way that love-struck teenagers use it to describe the object of their swooning affection. As a result of that deep-seated adoration, I order them whenever they appear on a menu, and, perhaps inevitably, I end up comparing that particular quail egg with every previous one I’ve ever had, which, expectedly, leads me to often be disappointed by the very nibble that I love so deeply. In the world of a food writer, at least, it’s a culinary paradox of epic proportions. So when our first amuse-bouche arrived at elements, the increasingly buzzed-about restaurant in Princeton, I was, initially, struck by a bolt of nervousness: How would this quail egg compare? Sure, a troika of them arrived dramatically cosseted in a gorgeous bird’s nest, nestled in the center as if they were the cooling core of a long-ago supernova. But how would it hold up to all the quail eggs of personal memory? And then I took a bite. I’m pretty sure I passed out for a moment. How had so much flavor, so much character, been packed into this innocent-looking mini-egg? At first it hit me with a deeply savory yet unexpectedly toned-up sense of tangy, vaguely wine-like earthiness. This eased into a deeper, equally soul-comforting smokiness that lingered on my tongue like the finish of a great glass of mature wine. Turns out that this sort of experience would happen throughout the meal, a tour-de-force that stands up as one of the most extraordinary dining experiences I’ve enjoyed in the past year. 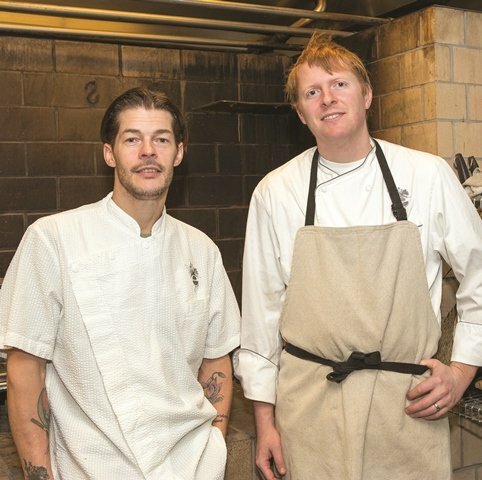 I’d heard the buzz, of course—what executive chef and co-owner Scott Anderson, chef de cuisine Mike Ryan, and their team of visionaries in the kitchen have been turning out since moving to the lovely, loft-like second-floor space above Mistral less than a year ago has slowly yet inexorably been gathering steam, with a propulsion of positive reviews and even more exuberant word of mouth inching it forward. So when their publicist emailed me and invited me in to check it out for myself, of course I said yes. There was, as always, a caveat: Whenever I’m invited in as a guest, I cannot ethically review the restaurant. But I said that I’d check it out for a feature story on the restaurant, figuring that, even if I didn’t love the meal, there was at least an interesting story there regardless. I had nothing to worry about: It was love at first bite. Because elements (the name is not capitalized), from its perch in downtown Princeton, has managed to find that proverbial razor’s-edge balance between the avant-garde and the comforting, successfully tapping into many of the key components that are defining our current culinary zeitgeist—a respect for seasonality, a focus on pristine ingredients, a willingness to employ modern technique yet never as an end in and of itself, but rather as a means to one—without falling victim to its many potential pitfalls. Nothing feels contrived here, in other words, which began to make perfect sense once I asked Chef Anderson about it. In light of the meal itself, his comments make perfect sense. Because dish after dish seemed to have sprung from a team of culinary minds electric with ideas, able to turn excellent ingredients into unexpected and highly rewarding dishes that I’m still thinking about well after actually having eaten them. 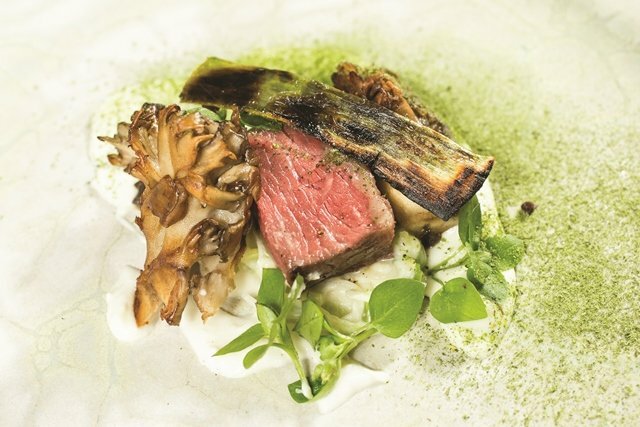 Australian Wagyu beef, cooked sous vide to dizzying tenderness, found its perfect accompaniment with a maitake mushroom that both echoed the buttery meat’s richness and cut through it at the same time. The insanely tender snow crab’s inherent sweetness pushed up against the soulfulness of a mustard-kissed chicken jus and an emulsified crab-stock sauce as evocative as any I’ve ever tasted. A dessert of chocolate ganache practically vibrated with paprika. And more. So much more. Pairing all of this with wine could cause major problems for a lesser wine director than Carl Harrison Rohrbach, but the list that he has created is full of bottles and glasses, from classics to far lesser-known gems, that provide him the perfect starting point from which to discern combinations with the food that elevate both. 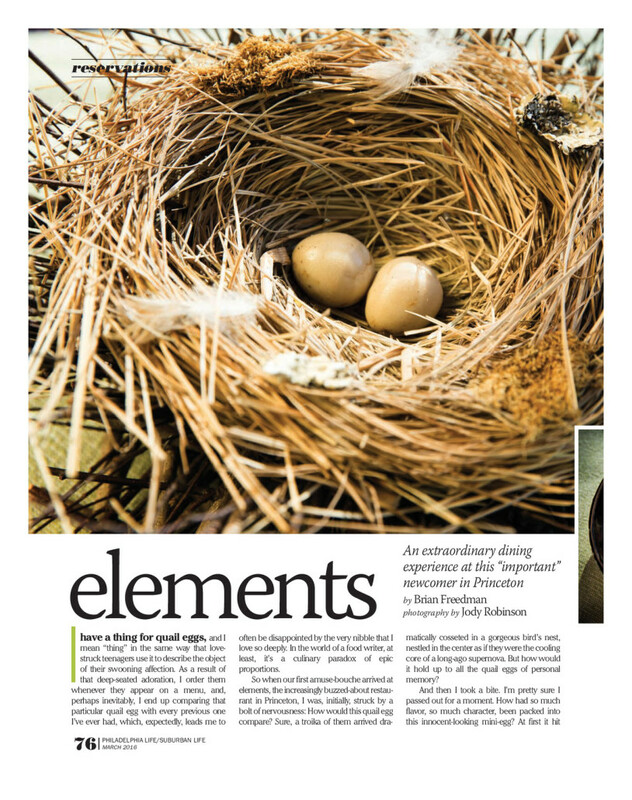 A night at elements, then, is worth the trip no matter where in the region you live. I’d just book your table sooner rather than later. 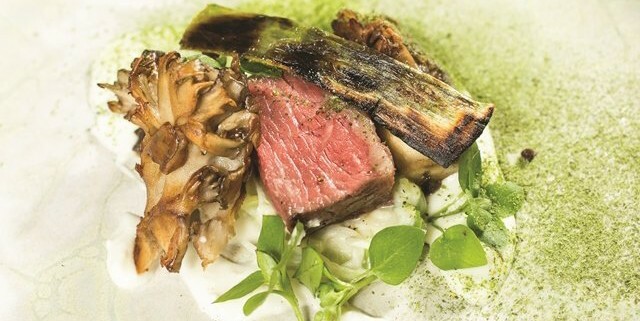 With only 28 seats, reservations are sure to become ever more difficult to score as word gets out not just how enjoyable an experience a dinner at elements is, but how important a restaurant it’s becoming. 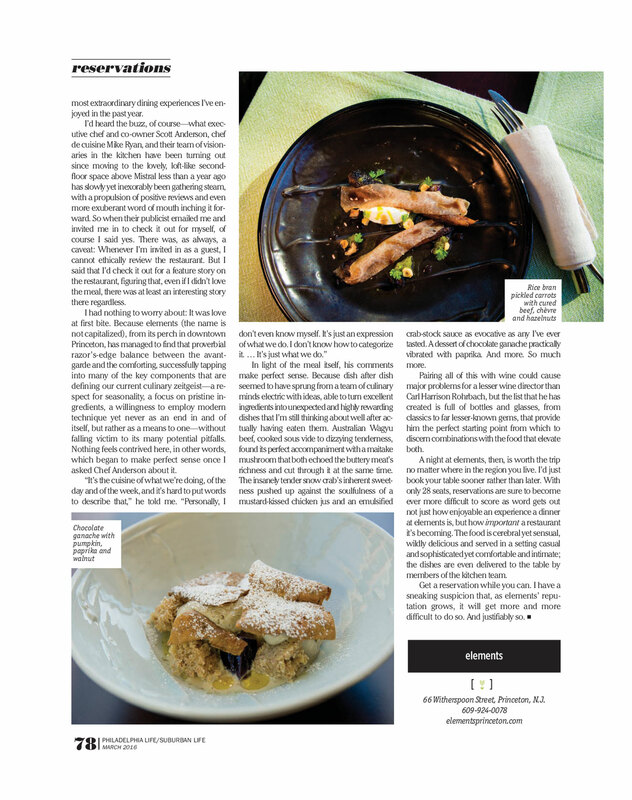 The food is cerebral yet sensual, wildly delicious and served in a setting casual and sophisticated yet comfortable and intimate; the dishes are even delivered to the table by members of the kitchen team. Get a reservation while you can. I have a sneaking suspicion that, as elements’ reputation grows, it will get more and more difficult to do so. And justifiably so.